A pacemaker helps control abnormal heart rhythms. It uses electrical pulses to prompt the heart to beat at a normal rate. It can speed up a slow heart rhythm, control a fast heart rhythm, and coordinate the chambers of the heart. An ICD monitors heart rhythms. If it senses dangerous rhythms, it delivers shocks. This treatment is called defibrillation. An ICD can help control life-threatening arrhythmias, especially those that can cause sudden cardiac arrest (SCA). Most new ICDs can act as both a pacemaker and a defibrillator. Many ICDs also record the heart's electrical patterns when there is an abnormal heartbeat. This can help the doctor plan future treatment. 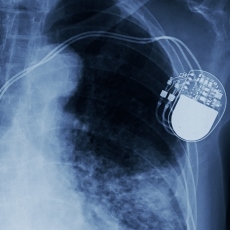 Getting a pacemaker or ICD requires minor surgery. You usually need to stay in the hospital for a day or two, so your doctor can make sure that the device is working well. You will probably be back to your normal activities within a few days. Article: Nursing Management for Patients Postoperative Cardiac Implantable Electronic Device Placement. Article: Explanting Chronic Coronary Sinus Leads.